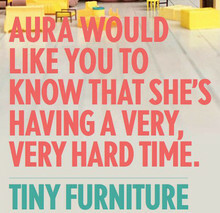 Tiny Furniture is written and directed by wunderkind Lena Dunham, who also stars in the film. The hip film of the moment was wholly created by the 24-year-old, and meditates on what many her age think about — what now? Loosely scripted, Tiny Furniture deals more precisely with moments. It makes perfect sense as Aura (Dunham) has just graduated college and has what you may refer to as the post-graduate blues. Back at home in Tribeca with her sister, Nadine, and photographer mother, Siri, (played by Dunham’s real life sister and mother, respectively) they seem to be getting on fine without her. Soon she’s juggling the attention of two men — one a YouTube celebrity, the other a chef — as she attempts to figure out just what it is she wants. If the film hits any mark, it’s the life of a post-graduate. They have an inherent self-centeredness only because they’re in a sort of limbo. Aura places incredible weight on every single encounter, every moment, on every syllable spoken. She meets up with old friends and makes new ones as she goes through her self-transformation. She seeks help from her family but they only seem to irritate her no matter how they act. If they coddle her, she’s quick to remind them that she’s a college graduate, but if they act as if everything’s as it always was before her studies, as her mother often does, she accuses them of ignoring her. What Dunham has done, then, is create not so much a film but a fictional documentary that follows a sort of surrogate for herself. Anyone in their early to mid-twenties will no doubt find familiarity in much of the situations she finds herself in. And while it’s incredible that such a young talent could create something so true, the film, like Aura, has its limitations. Whatever “moral” it seems to have is muddled, but then again, so are most life lessons. Still, it’s not a film that’s either very subtle or complex, leaving further viewings rather stale. But it does showcase that Dunham has a force, and one that will only be matured and harnessed over time.